The Irish government has kept its promise to restore fishing rights for Northern Ireland registered boats. The breakdown of a 50-year gentleman's agreement led to the seizure of two Northern Ireland registered boats by the Irish Navy last month. Following an outcry the Taoiseach (Irish prime minister) Leo Varadkar promised to sort the issue out. A bill was passed by the Dáil (Irish parliament) restoring access on Thursday evening. 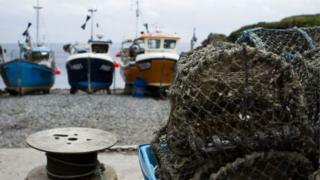 Fishermen from Northern Ireland had been banned from fishing inside the Republic's 6-mile-limit. But the Northern Ireland authorities did not retaliate and fishermen from the Republic continued to be allowed into Northern Ireland inshore waters. Fishermen from both sides of the border had enjoyed reciprocal access to each other's waters after an ad-hoc arrangement dating back to the sixties. But it collapsed after a 2016 legal challenge by Irish fishermen concerned about overfishing of seed mussel stock. The Irish Supreme Court ruled that for the arrangement to continue it would have to be formalised in legislation. But the process got bogged down in wider concerns over Brexit fisheries and little progress was made on the bill. The Dáil voted through the final stages of the legislation in one sitting on Thursday night. Irish Agriculture Minister Michael Creed said he was "extremely pleased" it had passed. But the move has angered some Irish fishermen. One of those who took the Supreme Court challenge had embarked on a hunger strike outside the Dáil in opposition to restoration of access. On Thursday, TDs (members of the Irish parliament) voted for the bill by 71 votes to eight votes against. Some TDs who opposed the legislation argued that Dutch fishing vessels are coming into Irish waters using "Northern Ireland flags of convenience" and "pillaging" our fish stocks. Independent TD Clare Daly said: "There is a very big problem with Dutch corporations flying under Northern Ireland flags of convenience coming to our shores and decimating our natural resources."